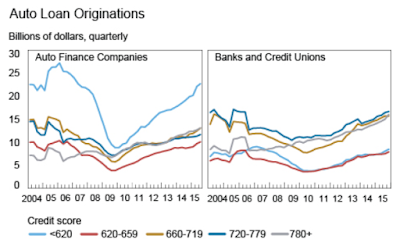 Mish's Global Economic Trend Analysis: Auto Originations Hit 10-Year High, Subprime Loans Fuel Growth; Party About Over? 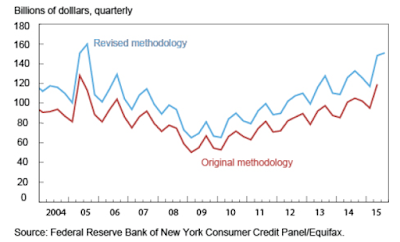 Auto Originations Hit 10-Year High, Subprime Loans Fuel Growth; Party About Over? A New York Fed study notes a huge surge in subprime auto loans after taking into account a newer, more accurate methodology. The new approach takes into consideration new originations as opposed to new accounts. 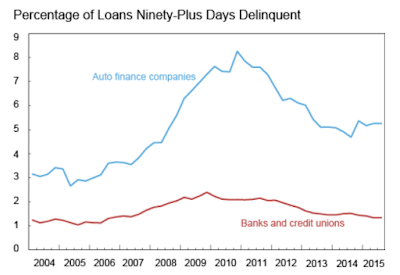 The result was an upward shift in the volume of newly originated auto loans by 25 to 30 percent. A credit score of 660 is the generally acknowledged line between good and poor credit. Scores below 620 are outright awful. With those numbers in mind, let's see how things stack up. Originations hit $156.8 billion in the third quarter, the highest level in a decade. 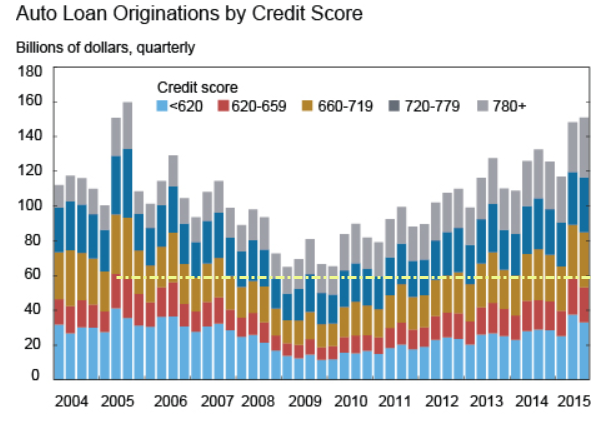 Loans to borrowers with scores below 620 jumped to nearly $40 billion in the second quarter. Loans to borrowers with credit scores below 660 are the highest since 2005. 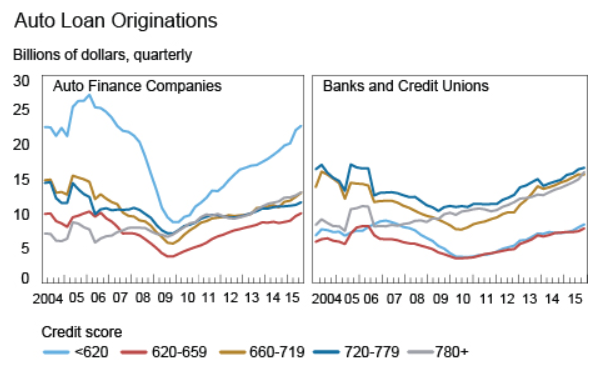 The reports notes "With the surge in the second quarter, the total number of subprime originations has since reached a ten-year, pre-crisis high, only surpassed by the unique periods in 2005 that were associated with 'employee pricing' promotions and record sales for the auto manufacturers." Will "employee pricing" once again mark the last hurrah? The uptick in delinquencies is modest so far. Nonetheless, some banks have become concerned. For example, the New York Times reported in March Wells Fargo Puts a Ceiling on Subprime Auto Loans. Wells Fargo, one of the largest subprime car lenders, is pulling back from that roaring market, a move that is being felt throughout the broader auto industry. The giant San Francisco bank, known for its stagecoach logo and its steady profits, has been at the center of the boom in making loans to people with tarnished credit scores. Wall Street, meanwhile, has been bundling and selling such loans as securities to investors, reaping big profits while allowing millions of financially troubled borrowers to buy cars. But now, amid signs that the market is overheating, Wells Fargo has imposed a cap for the first time on the amount of loans it will extend to subprime borrowers. The bank is limiting the dollar volume of its subprime auto originations to 10 percent of its overall auto loan originations, which last year totaled $29.9 billion, bank executives said. Typically banks react too late, after most of the damage has been done. It's the same every cycle. By the time credit is available to those on the bottom rung, the party is about over. Regardless, and as I have pointed out numerous times, the surge in autos is one of the few things holding up consumer spending and is also the only bright spot at all of manufacturing. What cannot go on forever won't. And it's nearly the end of the line for autos. Repercussions will be deeper than economists expect.